As I thought about which books are most important to me and my development as an artist, it gradually dawned on me that it would not be a reading list. There are two reasons for this peculiar paradox. First, I am a visual artist; I live and breathe images, and consequently my book list is more image-oriented than text-based. Second, I’m an introvert: when I look at art, I prefer to listen to my own thoughts and explore my feelings rather than be told by someone else what the work is about. After I hear the music of a work of art, after it has touched my heart, then I want to read the libretto, know what the experts have to say about it, bring the wisdom of the ages to enhance the experience. That said, the first book on my list has the perfect balance of beautiful images and extraordinary text. 1. Drawing Lessons of the Great Masters by Robert Beverly Hale is a book for professional artists, for those who intend to make art their profession, and for amateurs who take art seriously. It is a collection of 100 master drawings analyzed from the standpoint of good draftsmanship by legendary League instructor Robert Beverly Hale. Each drawing occupies a full page and is accompanied by the author’s commentary on the opposite page. Hale examines basic drawing problems with remarkable clarity and insight and demonstrates how those problems were resolved by great artists. He was a master at taking complex, sophisticated concepts and explaining them in very simple, understandable language. I refer to this book as my bible and recommend it to all my students. It is a bit like studying with the greatest draftsmen of all time with Hale acting as their interpreter. Each chapter focuses on a fundamental aspect of good drawing with the final chapter — “Driving All the Horses at Once,” my favorite — explaining how all these aspects are expressed simultaneously. I was fortunate enough to have taken Hale’s class and can still hear his voice as I read the text. I’ve worn out and given away multiple copies of this book. Frank Mason’s oil study Witness, Peter’s Denial from Gloria in Excelsis Deo. 2. Gloria in Excelsis Deo by Frank Mason is a collection of religious drawings and paintings by another legendary League instructor, Frank Mason, my mentor and friend for over thirty years. The works reproduced in this volume are an expression of the artist’s deep Christian faith and his faith in art. The images in each of the eighteen chapters are accompanied by the scriptural passage which inspired them, augmented with Mason’s commentary. 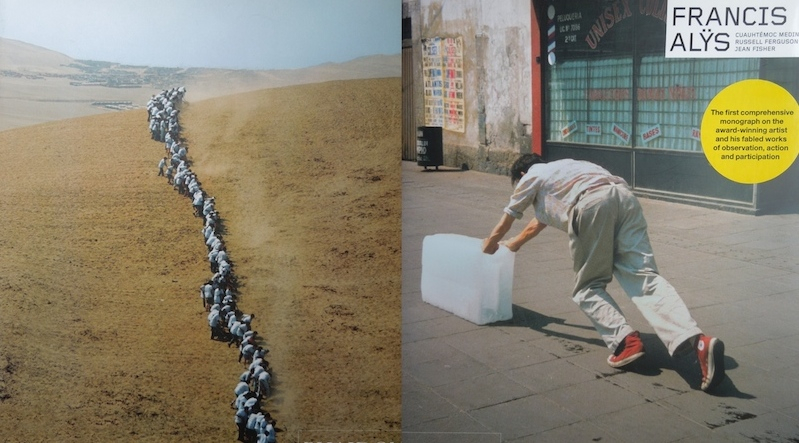 These images are both inspirational and educational. There are numerous drawings and oil studies for large paintings, a gold mine for any artist aspiring to do figure compositions. 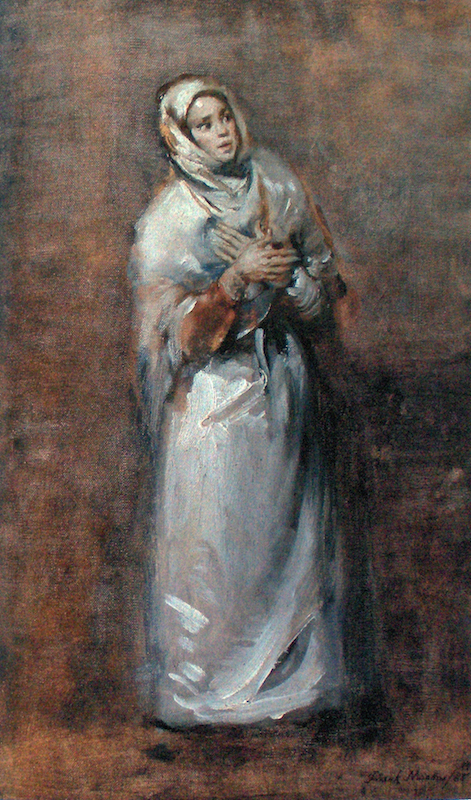 Large figure compositions can be easily seen in churches and museums, but the studies for those works are often lost or destroyed. The studies in this book were never meant to be seen by anyone but the artist, but here Mason presents his creative process for all to see. His facility with both chalk and brush are a marvel to behold. The art world is indebted to Mason for helping to keep classical and religious painting alive through the turbulent 1950s and 60s. This beautiful book is a tribute to that effort. Jacques Maroger was the head of restoration at the Louvre for many years. As a master chemist, and very competent artist, he was the ideal candidate to research these lost mediums. The first section of the book has a chapter on the importance of drawing, followed by chapters on encaustic and tempera painting. Next are chapters on the invention of oil painting, lead and wax mediums, and the techniques of Rubens, the Dutch Masters, and Velásquez, and finally, why the mediums were lost. The second section contains recipes for the mediums discussed in the first section and detailed descriptions on how to use them. The third section explores the materials used by the masters and has notes on the preparation of grounds. There are some artists and restorers who disagree with Maroger’s conclusions and his formulas making this a somewhat controversial book. I, however, think this is the most astute book ever written on painting techniques, and for those who are interested in such things it is indispensable. 4. Great Drawings of All Time by Ira Moskowitz is a tremendous collection of some 1,100 drawings, many the actual size of the originals, beautifully reproduced in a large format. They are in full color which is important for those works done on toned paper or created with multiple colored chalks or inks. Moskowitz and his publisher started with the idea of a book of one hundred drawings but the project kept growing until, seven years later, it filled four volumes, which cover Italian, German, Flemish, Dutch, French, Oriental (their word not mine), Spanish, English, American, and contemporary work. Drawings have come down to us in much better condition than paintings or even frescoes. So when I want to know how an artist thought, I always look first to his/her drawings. I had a culturally-deprived childhood; while working in the Art Students League’s library as a student, these volumes introduced me to many of the world’s greatest artists. I came to know some of them through these drawings before I ever saw one of their paintings or sculptures. This is a lovely way to get to know an artist because drawings are personal, intimate illustrations of the artist’s vision. They are often the original and least inhibited expressions of new ideas. When you are looking at a drawing, you are seated right beside the artist, no matter how long ago that artist lived. The masters who created the drawings in these volumes taught me the greatest lessons of all time. 5. Arts and Ideas by William Fleming is a history of the arts that explores major movements in painting, sculpture, architecture, literature, music, and philosophy from antiquity to the present. In Genesis we read that God created man in his own image and likeness. Man, therefore, like God, was creative. From cave painting to the present, that creativity has been expressed in countless ingenious ways. Fleming has attempted to chronicle those countless manifestations in a single book and succeeds beautifully in presenting a relatively complete, albeit succinct, history of human culture. This book became my art history textbook. I like that it is not just a history of painting but also discusses many of the arts together: how, for instance, Baroque painting, music and architecture developed and how one discipline affected the other. The book also has timetables at the beginning of each chapter listing dates for artists, writers, philosophers, etc. who worked in each period. I may not have thought of Mozart, Goya, and Thomas Jefferson as contemporaries but their dates do, in fact, overlap. It is rather daunting to study all of humanity’s artistic accomplishments, but Fleming presents the various periods, philosophies, artists, and trends in a way that makes you want to explore each in more detail, and for that I am eternally grateful. 6. There are many books on Rembrandt’s paintings but Horst Gerson’s Rembrandt Paintings is the one I like the most. It’s a big, fat coffee table book with large reproductions. The extensive text by Horst Gerson, who was for many years the director of the Netherlands National Center for Art History at the Hague, is written from the point of view of an art historian, which held little interest for me as a young artist. As I matured, however, my eyes would fall on some interesting or useful passages. But, to be honest, it is the large, full-page color reproductions that accompany the text and the complete catalog of his work, reproduced in black and white, that made me revisit this book so often. I don’t see any point in trying to summarize Rembrandt’s work here. Everyone, from realist to abstractionist, amateur to professional, cultural naif to scholar know and love his paintings. The large reproductions in this volume kept me spellbound for hours. In my student days, whenever I had time, I would flip open the book and draw whichever painting appeared before me. In addition to this volume I would recommend having books on his complete drawings and etchings on your shelf too. 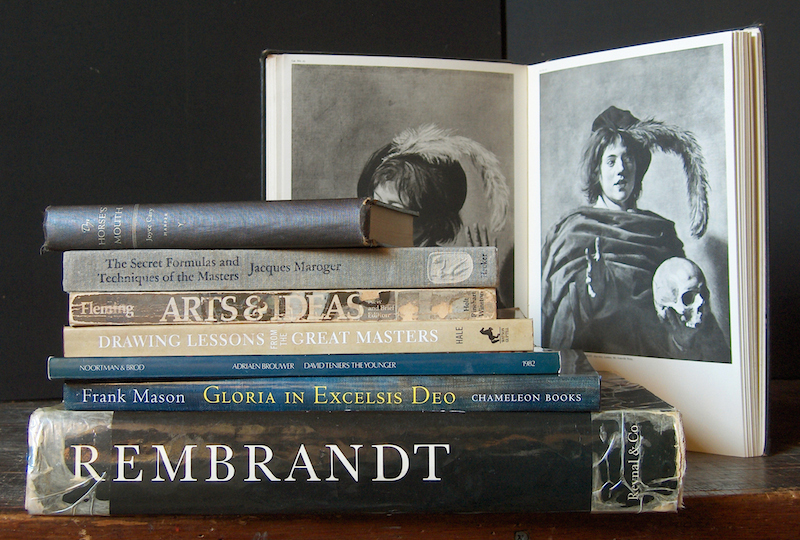 I own a dozen or more other books on Rembrandt, and have probably read another dozen. Everyone has their own favorite Rembrandt book; this volume happens to be mine. 7. 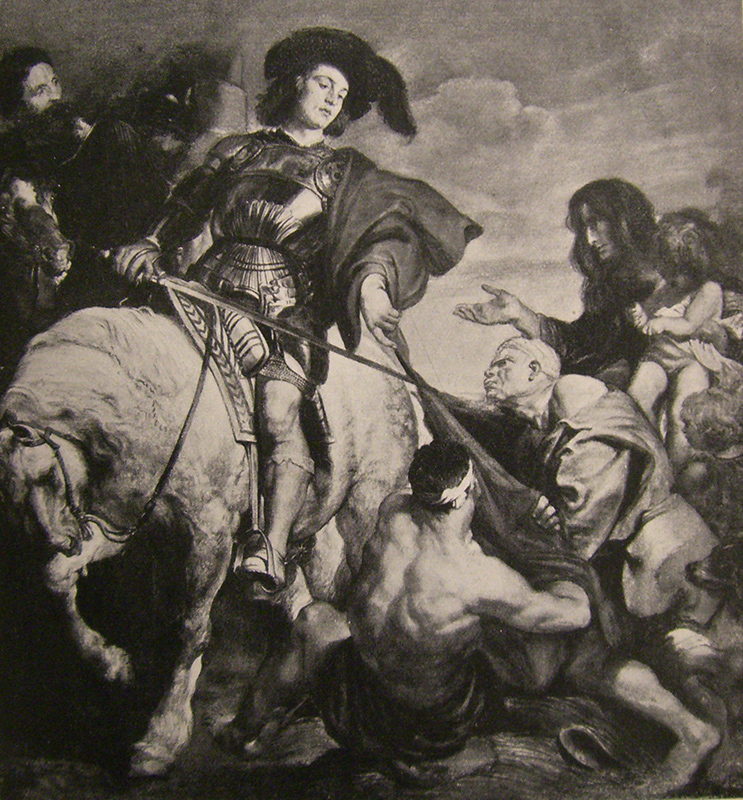 Klassiker der Kunst in Gesamtausgaben by Emil Schaeffer is a series of monographs on great artists. There are at least twenty-five volumes that I am aware of, possibly more. I would come across a volume from time to time in a second hand bookstore (before the age of the Internet) and would have a hard time putting it down. The text is in German, which I cannot read, but I could read about these artists elsewhere. The reproductions are all in black and white. They are, however, really good old black and white images, subtle and atmospheric. Digital photography may produce more exact reproductions, but I think these old images are closer to the artist’s vision, in the same way that photo realism is a more meticulous way of painting than an atmospheric approach but the atmospheric approach can give a truer sense of a scene. Of the volumes I own the one on Van Dyck is my favorite. Every painting he created is breathtakingly beautiful, both visually and technically. He had a profound effect on me as my artistic vision was developing. In this book there is one masterpiece after another, some, which were photographed before being over-cleaned by modern restorers, look more like what Van Dyck intended the paintings to look like than what we now see hanging in museums. Because I am always in search of an artist’s intent and vision, I place a high value on this series of books. 8. Phaidon Press also has a series of monographs on great artists. 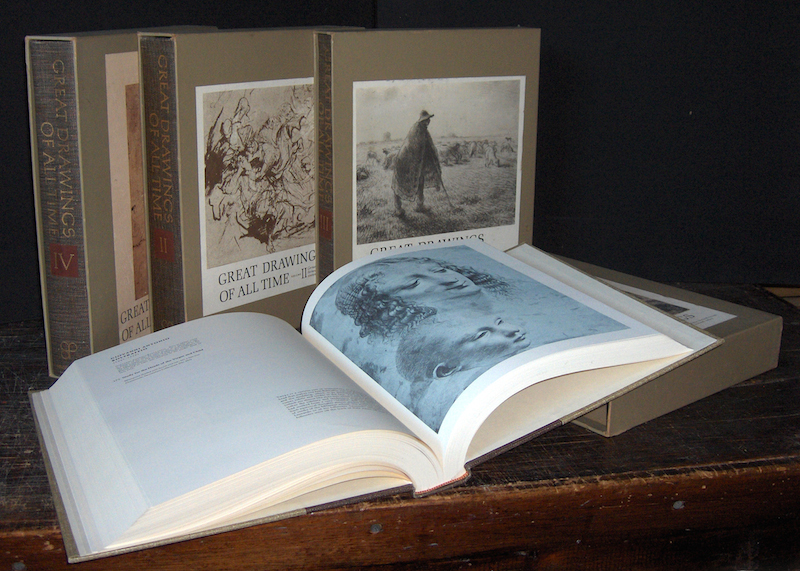 These books and images are a bit larger than the Klassiker der Kunst series. They are also less expensive which was an important factor for me in my youth. The reproductions are mostly black and white with a few color plates. In Frans Hals, N.S. Trivas states that “the present volume contains the authentic works by Frans Hals that are in a sufficiently good state of preservation to permit the study and appreciation of the artist’s facture.” There is a short biography and chronology, a review of his technique, and a nod to his “pupils, followers and imitators.” The most interesting texts, however, are the notes on each painting in the catalogue. Along with descriptions and provenance of each painting there is a note of the condition of the piece and what is known about its restoration history, valuable information for anyone studying these works. Frans Hals was a remarkable painter who was equally comfortable letting the brush fly when he was painting his children or finishing a lace collar to perfection on a commissioned portrait. Everyone he painted (except the children) seems like someone you would want to have a beer with, and Hals probably did. I have always been in awe of his free and confident brushwork; it is impossible for me to look at a painting by Hals without smiling. Sadly, this enormously talented artist spent his final years in the poor house supported by the state; happily, however, that same poor house is now the Frans Hals Museum. To be perfectly honest I’m a sucker for any book on Hals, but the Phaidon edition is my favorite. 9. 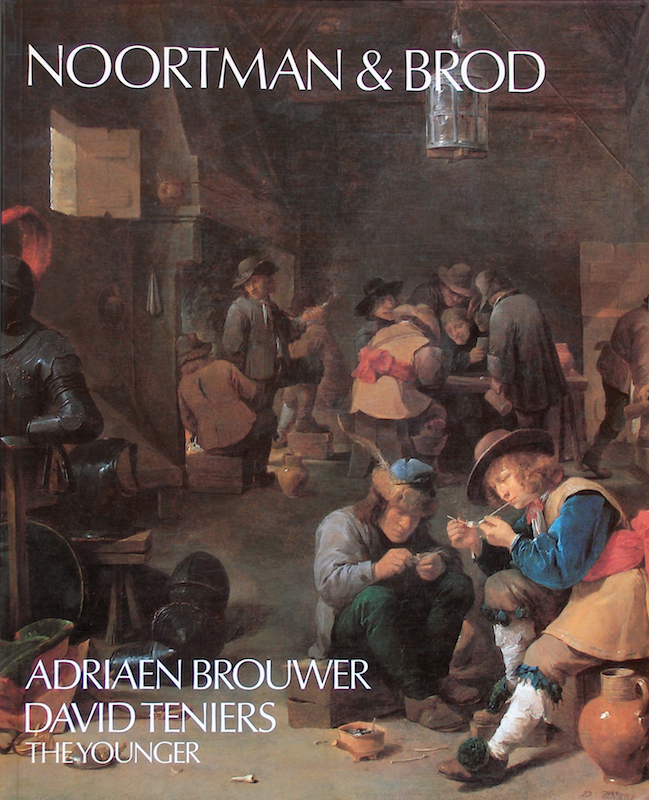 Adrien Brouwer and David Teniers the Younger by Margret Klinge is the catalogue of a show I saw at Noortman & Brod on Madison Avenue in 1982. It was a loan exhibit of little gems by two of the Little Dutchmen. Brouwer and Teniers are often shown together because they were about the same age, had similar techniques, and both lived and worked in Antwerp. Brouwer, however, led an unsettled life, frequenting taverns and smoking dens (where he found the subjects for his paintings) and died at the young age of 33. Teniers, on the other hand, strove for wealth, fame, and recognition. He married Anna Brueghel, daughter of Jan Brueghel the Elder. (Rubens was a signatory to their marriage contract.) His genre scenes were clearly painted by an observer, not a participant, and he lived to the ripe old age of eighty. Consequently, many more of his paintings have survived than have Brouwer’s, so he has more pieces in this exhibit and its catalog. Although I respect Teniers’ work, I am much more interested in Brouwer’s paintings. Generally small genre scenes of drinkers and smokers, barbers and dentists, card players and musicians going about their daily activities in parlors and taverns, these are paintings of lively characters created with extraordinary skill. It’s easy to overlook the masterful handling of the paint because the scenes are so vivid. Rubens, however, admired and collected his work. There were no fewer than sixteen paintings by Brouwer listed in Rubens’ estate at the time of his death. Because little is known about Brouwer’s life and only a few of his paintings have survived, it is hard to find a monograph on his work. That makes this catalog all the more valuable. Most of the books on this list had a tremendous effect on me as a young art student, a few I discovered later in life. As I matured and developed as an artist, however, I found myself spending less and less time looking to other artists and experts for guidance and inspiration. My artistic philosophy that took root in these books has grown and blossomed with fresh new ideas. These books are now treasured old friends, but whether I look at the books on this list once a week or once a decade they all continue to hold a place of honor on my bookshelf. Thomas Torak is an instructor at the Art Students League of New York. His website is thomastorak.com. 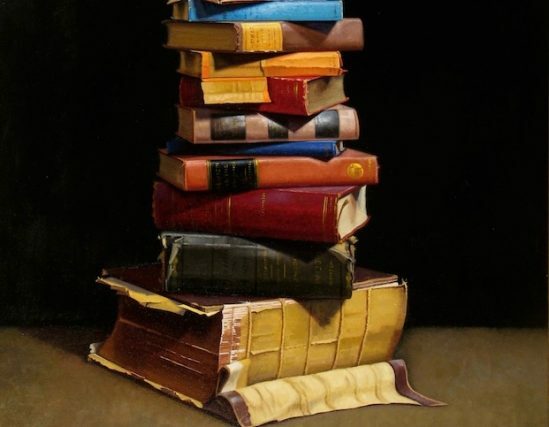 You can see the list of titles, expanding as the Artist’s Bookshelf series continues, on our dedicated Pinterest board.